After spending two days walking around the hills and pueblos blancos, or white villages, around Ronda, we returned to Sevilla for one night. It was like coming home. We went to one more flamenco show, an intense, beautiful performance at Casa de la Memoria Al-Andalus with a guitarist whose hands flashed as he played. We had pimientos de Padrón one more time at Modesto. Becca bought another shirt at Zara. And we went back to the Alameda de Hercules park. The Alameda park in Sevilla was one of our favorite places in the city, which was odd because it wasn’t much of a park and more a long, skinny length of brown dirt and scrubby trees. It runs a long ways between the barrio of Macarena, where we initially stayed, and ends near the commercial, shopping district in the center of the city. They were clearly doing some remodeling, and one night, these giant metal statues showed up on the beds of even bigger trucks, but the construction didn’t stop people from congregating there almost every night, Monday through Friday. The bars and restaurants that line the Alameda draw a crowd that’s a bit hipster, a bit grungy, the type that will happily sit around a guitar for hours, but also lots of children, as the Spanish are big on keeping their kids up at all hours. Becca and I couldn’t understand it—they didn’t look grouchy or tired, which I always thought was the reason for putting your kids to bed at 9. In the U.S., everyone says that when you have a child, it changes your life, and I’m sure it does, but I get the feeling that it wouldn’t change your life so much here. We saw extended families at outdoor bars late at night, from babies to grandparents all time. If I ever have a child, I will definitely be the kind of mother who takes her baby to the bar. The best thing we had was their gussied-up, more veggie-filled versions of the tortilla española, with eggplant in my case and courgettes, or baby squash, in Becca’s. There was plenty of cheese and plenty of salt, and the layers of potato and egg and eggplant almost melted together, they were so smooth. We did have an odd seaweed pasta in a balsamic sauce, literally strips of seaweed taking the place of old-fashioned pasta. I’m sure it’s a low-carb dieter’s dream. It didn’t taste bad exactly, but it didn’t really taste good. Ambitious and imaginative, though, so I would give a B for effort. And to prove that it is not a restaurant devoted to self-deprivation, Almanara serves an insanely delicious chocolate dessert. I’m not quite sure what it is—who knows, it might have soy or something, but it’s almost as firm as a frozen custard without quite being an ice cream. It actually tastes like chocolate, unlike many chocolate desserts, and they serve it with those simple Maria biscuits I like so much. I have to admit, it was a bit of relief to arrive in Granada and eat Moroccan food. Maybe it was Jaime’s stories about the less-than-innocent origins of the Spanish love of pork, but I was ready to eat something other than jamón, and Granada turned out to be one of the best places to do so. All over Spain, I’d seen signs of Muslim immigration, but in Granada, the Moroccan presence was strongest, from the Moroccan crafts sold to tourists to the teterias or tea shops all over the Albayzin, the old and now new Muslim quarter. And of course, Granada is the home of the Alhambra. We had a good lunch at a random little shop, more of a café than a restaurant with low tables on which they served good hummus and kefta, translated for Spaniards as albondigas, and which we know as those Middle Eastern meatballs. And then we found dinner at Restaurante Arrayanes. It was obviously a popular restaurant and it filled up quickly after we walked in. The owner treated the restaurant like his baby and came to every table, asking if we needed anything, if we were enjoying ourselves. As a true Muslim restaurant, it didn’t serve alcohol, but it did serve a delicious lemonade made with mint. The food was good, if not the best Moroccan meal I’ve ever had, but one thing did truly stand out—the “Macedonian” dessert. It was the dessert of the day, not on the menu, and so I’m not quite sure if it’s literally called a “Macedonian.” It was a soft molded dessert, not quite a custard but not quite a cake. It was sweet without being cloying and so comforting, you could feed it to a baby. We argued for a bit about what was in it—Becca thought saffron and coconut, I argued that it was carrot. I was gleeful when it turned out I was right. It had reminded me very much of an Indian carrot pudding I had years ago in San Francisco. And so we were fortified for our hike up and around the Alhambra the next morning, but the need to cleanse myself of ham didn’t last long. The next night, we were back to plates of jam, cheese and olives, washed down with a touristy pitcher of sangria. Ah! Córdoba was an easy trip from Sevilla, a short train ride that deposited us quickly near the winding, narrow alleyways of the historic center, where the tourist-to-local ratio feels like it’s 10 to 1. But when we went just a few blocks beyond the Mezquita, the justly famous mosque, we found quiet streets lined with white buildings and colorful flowerpots hanging on the walls. Our favorite restaurant turned out to be just outside the old city walls. We had already had an afternoon snack at El Olivo, two glasses of manzanilla, the slightly salty yet appealing sherry so popular in Andalucia, and a plate of fried calamari, but we went back for dinner because of Jaime, the tour guide at Casa de Sefarad a museum devoted to the history of Sephardic Jews in Spain. Jaime will probably be one of my favorite memories of Spain, rivaling the sight of Becca whizzing around the Mezquita in a wheelchair to rest her lame foot. The museum is located close to the one synagogue that wasn’t destroyed in Córdoba, and although it’s very small, really just 5 or 6 rooms, Jaime has so much to say, you can’t help but leave feeling a bit heady. He’s a classic nerd, so intensely interested in his subject that he draws everyone in, like a black hole. But he’s not at all the shy, retiring kind of nerd. He’s more like the arrogant professor who’s well-aware that he knows a lot, and although that would be annoying in a friend, it’s quite ideal in a tour guide. We learned from Jaime how the Spanish love of jamon and all pork products comes, in part, from the Spanish desire to distinguish themselves from Jews or, in the case of the convertidos, to prove that they were no longer Jews after their expulsion in 1492. He also told us how at the same time, many of Spain’s most beloved dishes have Jewish origins. He talked about Maimonides, about families buying documents to hide their Jewish origins, and about how expelled Sephardic families sought to preserve their memories of their lives in Spain. Whenever he asked if there were any questions, he was met by a stunned, yet gratified silence. After we stopped laughing, he did recommend “El Olivo,” and thus cemented his place in my memories as a most knowledgeable person. The plaza, which had been sunny and pleasant earlier, was now golden with the light reflecting off the stone of the city walls. It was mid-October and we were sitting outside in weather that felt like the best of New York’s summer nights. Becca loved her pisto, which turned out to be a Spanish version of ratatouille served with two fried eggs. There were plenty of tomatoes to make it sweet and lovable. And then the kind old waiter brought us, on the house, glasses of ice-cold sweet lemony liqueur. Sevilla seems like the kind of place where people would eat fried fish. The Rio Guadalquivir runs through the town, with most of the old city on the eastern bank, but with the old fishing neighborhood of Triana on the western bank. The city has developed smooth bike lanes that run along much of the river, as well as a lovely new bicycle-based public transportation system, Sevici, where you can pick up a bike from one station and drop it off at another station clear across town for about 1 Euro every half hour. The bikes are insanely heavy, maybe to keep you from being tempted to steal it, but they have sturdy bike baskets, good night lights, and everything else you would need to cruise around town. Brand-new bike system + brand-new river-view bike lanes = sheer joy. So back to the fried fish. It’s such a stereotype that people in Sevilla don’t work very much and just enjoy life sitting in the thousand little plazas that dot the city, but cruising around town and sitting in those same plazas ourselves, it did seem sort of true. And that kind of carefree, easygoing attitude just seems to go with an affinity for fried fish, especially since fried fish goes so well with a sunny plaza and a cold beer. Of course, my view is probably colored by the fact that Sevilla actually is famous for pescaito frito, or a platter of assorted fried fish. One night, Becca and I biked from our apartment on the western edge of the old city to the Jardines Murillo, the northeastern edge. We made our way to Modesto, a casual seafood-focused restaurant so big and popular, it took up two separate plazas and two separate indoor spaces facing each other. We got a platter of pimentos de padron to share, while she ordered the famed pescaito frito and I got the cazón frito en adobo. The pimientos de padrón were on my to-do list because of an essay by Calvin Trillin in his book, “Feeding a Yen.” (Others say, “I did Madrid,” or “I did Granada,” but I say, “I did pimientos de padrón.”) According to Calvin Trillin, they come from Galicia, the state on the northwestern tip of Spain. They are local only to Galicia and are extremely hard to find outside of Galicia, as their season is also very short. In fact, I don’t even know for sure that our pimientos de padrón were the real thing. But I do know for sure that they were very good. They turned out to be thin-skinned little green peppers, fried and then liberally salted with sea salt. It was like eating potato chips but better. They were the only green peppers I have ever really loved. Every once in awhile, and you have no idea when, you may encounter a spicy one, but they’re otherwise mild and easily lovable. Becca loved them so much, we came back our last day in Sevilla and ordered one platter and then another. They went excellently with Cruzcampo, the light and tasty local beer. The fried cazón turned out to be chunks of tender dogfish tossed or marinated in some sort of spice that made it pleasantly salty and almost tart. We enjoyed this very much, too. The famed pescaito, however, was not so universally loved. It was another dish that I ate most of, even though Becca had ordered it. There was quite an assortment of fish, from fried anchovies to small red, curled-up fish (had they died that way? ), even a bit of fried fish roe. I popped the fried anchovies like they were popcorn and was thankful for my good appetite. When we came back almost a week later and ate our two plates of pimientos, we also shared a plate of coquinas, these skinny little clams barely bigger than the tip of your thumb. They’d been cooked in lots of olive oil and salt, and I loved them, too. I hope New York gets a public bike system soon. Mayor Bloomberg, do you hear me? We already have the river, if not the attitude. Would it be too much to also hope for a place that sells pimentos de padron, fried fish, and coquinas, and maybe an extra plaza or two? Arriving in Sevilla was a joy. My flight left Barcelona before dawn, but when I arrived in Sevilla at 9:30 a.m., it was sunny and just starting to get warm. The apartment Becca and I rented was in the barrio of Macarena, a formerly working class neighborhood on the western edge of the old city that is being colonized by hipsters, complete with hipster dads pushing strollers through the nearby park, Alameda de Hercules. I had found it online at Embrujo de Sevilla, and it went beyond all expectations, with its soaring ceilings, sparkling clean, bright IKEA furniture, a dishwasher and washing machine, AND a roof terrace. It was nicer than my own apartment. In many ways, Sevilla reminded me of Mexico, and Becca agreed, it was the most Latin American of the Spanish cities she’s been to. The buildings were low and brightly painted, and you knew there were sunny courtyards in nearly every one. Even the machismo was the same; after two weeks of walking unnoticed, I started getting catcalls and kissy noises again. People spoke even more quickly than they had in Madrid, and they swallowed the ends of their words like Caribbeans, but they smiled more easily than their compatriots in Madrid and I felt happy again that I could speak Spanish, más o menos. And being outside Spain’s biggest cities, I began to see and enjoy the little mistranslations I saw everywhere. Growing up in Korea, we’d always gotten a big kick out of the way Korean words were translated into English, and it was strangely gratifying to see the Spanish were as bad as the Koreans. The best, or the worst, was definitely at Taberna del Alabardero, a restaurant in Sevilla, where at the end of our meal, we were presented with an evaluation form, including a place to rate the “saw-off” we got. But the meal itself was one of the loveliest Becca and I had in Andalucía. It looked like a favorite of moneyed Sevillians, judging by the way the other guests were dressed, but the happy waitress was warm without formality, as the restaurant itself is. When you walk in, you see a classic Sevillian space, a light and airy courtyard brightened even more by its yellow paint. The dining rooms are off the courtyard and have beautiful Moorish tiles to look at while you eat. The food was also classically Spanish, simple, a bit too salty, and very flavorful. I loved my appetizer of “maccarones con salsa de tinta y calamares,” the pasta and squid so perfectly toothsome. Becca also loved her “crema de puerro con salteado de verduras y langostinos,” a creamy leek soup with deeply caramelized vegetables and shrimp. Our favorite, though, was the “merluza en salsa verde,” or hake in a herby green sauce, served with a poached egg. The fish was obviously fresh, the sauce very bright and it managed to be delicious in and of itself, without needing to resort to heavy flavors. Becca didn’t like her “chuleta de cerdo con col y melocoton,” or pork with caramelized cabbage and a peach sauce but I loved it. We realized Becca doesn’t really like the texture of most Spanish meat, but I liked the way it was both flavorful and chewy without being dry, and I loved the peach sauce which was more tart than sweet. 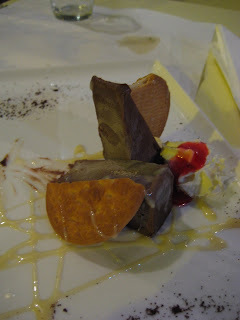 We couldn’t miss dessert—the whole three-course meal only cost 12,90 Euros! I also learned that Becca doesn’t like soft desserts, other than whipped cream, as she wasn’t too fond of the “flan de naranja con magdalena tibia y salsa de menta,” or orange flan with madeleines and mint sauce, or the chocolate mousse cake that was the special of the day. It was a happy realization for me, since I got to eat almost all of both desserts. But as always, the best meals aren’t only about the food. Our young waitress, more blonde than you would ever expect a Spaniard to be, was so happy and kind. She spoke fairly good English and only laughed when we started to confuse her by speaking English and Spanish simultaneously. When she saw me looking at the little bottles of olive oil on the table, she brought me 4 more to take home, which went immediately clinking into my bag. (I ended up leaving 3 in the apartment for future tenants, but took one in case I saw a good tomato on the road.) There was no question, we rated the “saw-off” as excellent.